Evaluation: Shooter first and foremost. Chase can really shoot it. His athleticism and ability to make plays off the bounce has improved over the last 12 months. He is a very dedicated worker and it shows in production. Had a cold July with his shot not falling at its usual clip. Now, Chase is becoming more than a specialist and his recruitment will display this. He has visited Northern Kentucky, Toledo and a few other locals. 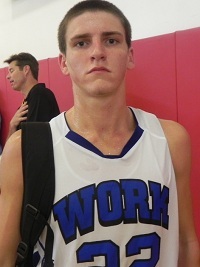 Bottom line: A Division I program must see Chase as a premiere shooter with enough athleticism to defend. Right now, only a few see him in that role but others are expected to be swayed this high school season. Chase is a sure fire Division II prospect who can play his way into the right Division I system. Notes: Committed t D2 Wheeling Jesuit (W.V.) in November 2012.